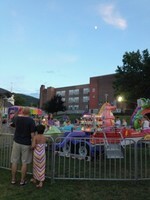 Every year the volunteer firefighters from Storm King Fire Engine Company #2 put all of their efforts into transforming the playing fields behind Cornwall-on-Hudson Elementary School into a fairway with rides, games of chance, music and, of course, food. 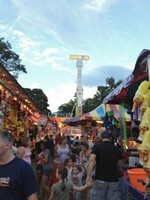 This year, the fair was held from July 25 through the 28, and despite losing two days of the fair due to rainstorms, people came and enjoyed themselves as they seem to do every year. The fireworks were also cancelled due to the weather but there will be more fireworks in September on the river after the Fireman's parade, Saturday September 22. Look out for details on the parade in the upcoming event listings and newsletters.